Dropped and broke your stage micrometer? Scratched while cleaning or mishandling it? Remember. Most stage micrometer’s substrate material consists of a fragile thin piece of glass or opal material and the scale image is manufactured with a chrome coating. Both the substrate material and image coating can be easily scratched during inappropriate cleaning and entire stage micrometer can easily be broken with the slightest impact. There are several solutions to avoid these mishaps that should be considered before or after purchasing a stage micrometer. Rather than purchasing a pure glass or opal stage micrometer, consider one where the scale is mounted into a metal frame. With the glass scale portion recessed into the metal frame most impact damage can be averted. In addition, various manufacturers offer a limited warranty on breakage for steel frame scale micrometer products. A glass coverslip will further protect the scale from dust and scratches while cleaning and in storage. A high quality storage box, such as a wooden box with padding, will further protect it when not in use or transit. Storage boxes are available in different sizes specifically designed for various sized stage micrometers. Storage. Damage often occurs when the stage micrometer is stored improperly. Always store the stage micrometer in its original packaging in a safe place and consider purchasing a high impact padded storage box that will increase the protection while not in use. Cleaning and handling. Damage often incurs when cleaning the stage micrometer with harsh chemicals or course rough cloth materials. 2. To further remove the remaining dirt and oil from the stage micrometer use only the following items: lens cleaning tissue, microfiber cleaning cloth or anti-static cleaning cloth with a lens cleaning solution (i.e. Reagent-Grade Isopropyl Alcohol, Reagent-Grade Acetone, etc. type solution). 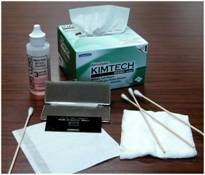 All of these products are readily available from various optical industry suppliers, lab houses or photo outlets such as B&H Photo, Edmund Optics, Ward Scientific, Newport Corp.
A second option that can be used to clean a stage micrometer is just your breath and a clean cleaning cloth. Your breathe has enough neutral moisture and used with the cleaning cloth it is sufficient to remove minor dirt and oil containments.